Information Solutions | Yokogawa South Africa (Pty.) 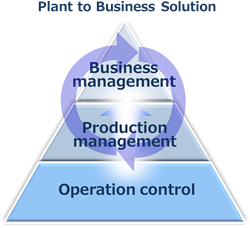 Ltd.
Yokogawa's concept of "Plant to Business Solution" for solutions through direct collaboration between field and management refers to information technology (IT) solutions, which solve problems through close collaboration between the field and management, which can be accomplished by management using the current conditions in the field for their decision making to maximize management efficiency and corporate value. Yokogawa's professional engineers get involved in customers' projects from the planning phase to help them to identify their problems and achieve their targets, and provide support throughout the whole system life cycle from consulting, solution development, operation, through to maintenance.